Audits of blood transfusion demonstrate around 20% transfusions are outside national recommendations and guidelines. Audit and feedback is a widely used quality improvement intervention but effects on clinical practice are variable, suggesting potential for enhancement. Behavioural theory, theoretical frameworks of behaviour change and behaviour change techniques provide systematic processes to enhance intervention. This study is part of a larger programme of work to promote the uptake of evidence-based transfusion practice. The objectives of this study are to design two theoretically enhanced audit and feedback interventions; one focused on content and one on delivery, and investigate the feasibility and acceptability. Study A (Content): A coding framework based on current evidence regarding audit and feedback, and behaviour change theory and frameworks will be developed and applied as part of a structured content analysis to specify the key components of existing feedback documents. Prototype feedback documents with enhanced content and also a protocol, describing principles for enhancing feedback content, will be developed. Study B (Delivery): Individual semi-structured interviews with healthcare professionals and observations of team meetings in four hospitals will be used to specify, and identify views about, current audit and feedback practice. Interviews will be based on a topic guide developed using the Theoretical Domains Framework and the Consolidated Framework for Implementation Research. Analysis of transcripts based on these frameworks will form the evidence base for developing a protocol describing an enhanced intervention that focuses on feedback delivery. Study C (Feasibility and Acceptability): Enhanced interventions will be piloted in four hospitals. Semi-structured interviews, questionnaires and observations will be used to assess feasibility and acceptability. This intervention development work reflects the UK Medical Research Council’s guidance on development of complex interventions, which emphasises the importance of a robust theoretical basis for intervention design and recommends systematic assessment of feasibility and acceptability prior to taking interventions to evaluation in a full-scale randomised study. The work-up includes specification of current practice so that, in the trials to be conducted later in this programme, there will be a clear distinction between the control (usual practice) conditions and the interventions to be evaluated. Blood components are scarce and costly resources that are used in almost every area of hospital practice. However, unnecessary blood transfusion is associated with negative consequences and presents an unnecessary risk to patients. Examples of risk are transfusion infections, acute lung injury, and circulatory overload, which are associated with increased morbidity and mortality ,. National guidelines  provide a framework for defining unnecessary transfusions. For example, in the case of red cell transfusion, by specifying the pre-transfusion haemoglobin concentrations at which it is appropriate to transfuse a patient in different clinical settings -. Similar evidence to inform recommendations applies for other blood components . Despite concerns about risks of transfusion , the practice of giving unnecessary transfusions persists. NHS Blood and Transplant (NHSBT) manage the provision of blood components for England and North Wales, and promote appropriate transfusion practice through national audits on transfusion practice. Regional and national audits have consistently demonstrated that at least 20% of the use of different blood components (i.e., red blood cells, plasma, and platelets) falls outside national guideline recommendations ,. There is thus the potential to save costs without compromising patient outcomes by reducing the number of unnecessary transfusions. Most quality improvement activity in blood transfusion has focused on improving safety of donated blood for transfusion. Increasing attention is now focusing on improving blood use by clinicians so that transfusion practice is more consistent with evidence-based recommendations . This protocol describes the first stage of a programme of research that aims to specify current feedback practice and then develop and evaluate enhanced methods to promote the uptake of evidence-based transfusion guidelines and reduce the unnecessary use of blood components. Implementation science has played a central role in developing and evaluating interventions that are designed to address the evidence-practice gap by targeting behaviour change amongst healthcare professionals within the organisations and systems in which they work ,. Audit and feedback (A&F) is a widely used intervention to improve the quality of health care, including blood transfusion practice through the NHSBT national audit programme. It is defined as any summary of clinical performance of healthcare over a specified period of time, to provide healthcare professionals with data on performance . There is evidence that A&F interventions deliver modest, variable, but worthwhile effects, with the recent Cochrane review  indicating an overall 4.3% (IQR 0.5% to 16%) increase in compliance with desired practice as a result of A&F in a range of clinical areas. The review investigated this heterogeneity and identified that A&F is more effective at changing practice when baseline performance is low, feedback is provided more than once, is delivered by a colleague or supervisor, is delivered in both verbal and written formats, and includes explicit targets and action plans. These findings contribute to the growing understanding of how A&F works by identifying its active ingredients and highlighting its potential mechanisms of action . It has been argued that theory and emerging evidence about how best to design (and not to design) A&F interventions should be incorporated into the development of future A&F interventions in order to identify how and when A&F works best, as such theoretical underpinnings are rarely reported in reviews of behavioural interventions -. Theories of behaviour change, used effectively in a wide variety of applied health research to explain and change behaviour ,, hold the potential to clarify mechanisms of action and to provide generalisable frameworks for understanding how interventions work ,. They also offer practical and systematic methods to guide intervention development in relation to clinical practice . However, there are a large number of behaviour change theories, often overlapping in their concepts, making it difficult to choose the most relevant to apply to a behaviour . To make theory more accessible, the Theoretical Domains Framework (TDF)  was developed, in which 128 constructs (key concepts) from 33 behaviour change theories were grouped into 12 theoretical domains including behavioural regulation, social influences, and beliefs about consequences. The framework has been used in a number of contexts within implementation research, and can be used to explore implementation problems, design interventions and understand behaviour change processes ,-. For example, the TDF has been applied to systematically identify the theoretical domains of greatest relevance to explaining blood transfusion practice in intensive care units, with ‘behavioural regulation’ identified as a key domain influencing practice . Behavioural regulation, defined as the processes of goal selection and goal achievement, involves the techniques of goal setting, monitoring, and providing feedback . Control Theory  is a theory of behavioural regulation which posits that individuals manage their behaviour by knowing what they want to do or achieve (i.e. setting a goal or standard), trying to do it (i.e. action), monitoring the behaviour (i.e. audit), assessing whether they are making progress towards the goal (i.e. feedback, which informs as to the nature and extent of any discrepancy between behaviour and goals), and adapting what they do in light of the feedback (i.e. action planning). We propose that organisations may also use these techniques to regulate the behaviour of individuals working in them. Theories of behaviour change are potentially useful for optimising A&F by pointing to behaviour change techniques that may augment the effectiveness of receiving feedback about clinical practice ,. The recent development of a comprehensive taxonomy of behaviour change techniques (BCTs)  provides a replicable and systematic method for identifying and describing intervention components that are consistent with Control Theory and that may enhance practice. BCTs are defined as the “observable, replicable and irreducible components of an intervention designed to alter or redirect causal processes that regulate behaviour” (i.e. the proposed ‘active ingredients’) . The taxonomy includes BCTs that encompass strategies proposed in Control Theory; for instance, ‘goal setting,’ ‘feedback on behaviour,’ ‘discrepancy between behaviour and goal,’ and ‘action planning’ . The current study uses Control Theory and the BCT Taxonomy to specify current A&F practice in blood transfusion and to inform the design of enhanced A&F interventions. BCTs applied at the level of the individual, and use of the TDF to identify potential barriers to change individuals’ behaviour, may not be the only approaches to improving transfusion practice or optimising A&F in the hospital context. Behaviour change within a healthcare setting is a complex process, and due to the multi-level nature of healthcare organisations, elements of change in response to feedback may be outside the control of any individual healthcare professional . Ferlie and Shortell  propose four levels of change that should be considered in order to maximise the chance of success: individual, group or team, overall organisation, and wider system or environment. Developing this idea, the Consolidated Framework for Implementation Research (CFIR)  provides a framework for identifying what works where and why across different organisational levels within multiple settings. Based on the considerations outlined above, the current study is designed to gather evidence to inform the enhancement of A&F practice, in ways that permit replication and continuing enhancement of A&F as an intervention to support clinical behaviour change in transfusion practice. This study is the first in the AFFINITIE Programme, funded by the UK National Institute of Health Research, which comprises four interrelated ‘workstreams’ to be conducted over five years (Figure 1). AFFINITIE Programme work streams overview. 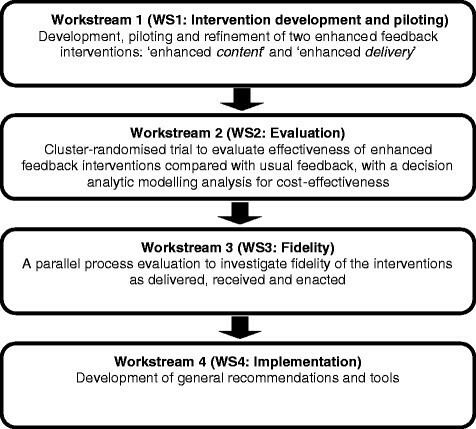 The workstream structure draws on the systematic methodological approach recommended in the UK Medical Research Council (MRC) guidance for developing and evaluating complex interventions , which provides a systematic approach to this work: intervention development, feasibility and piloting, evaluation, and implementation. The current paper presents the study protocol for workstream one (WS1: Intervention development and piloting), which addresses the intervention development, feasibility, and piloting components of the MRC framework. Two enhanced interventions will be designed and assessed for feasibility and acceptability. Theory will be applied to two key facets of A&F: the content of documents providing feedback and the processes of feedback delivery (including how it is delivered and to whom it is delivered). The interventions developed during WS1 (Intervention development and piloting), will be evaluated in workstream two (WS2: Evaluation) in two replicated 2 × 2 factorial cluster randomised control trials (C-RCT) in the context of a National Comparative Audit of blood transfusion. The development of these two interventions, one focusing on feedback content and the other focusing on feedback delivery, will thus be informed by theoretical frameworks of clinical behaviour change applied at the individual, team, and organisational levels. Development will also be informed by the early components of this study that will generate an evidence base from past A&F practice and from multi-method studies in the hospital context. Clinical and behaviour change experts will have input into the enhancement of these interventions, which will additionally be informed by the systematic collection and analysis of feasibility and acceptability data. Use the evidence base relating to A&F and behaviour change to describe current A&F practice relating to blood transfusion, focusing on two aspects of current practice: content and delivery. Apply systematic methods and the evidence about current practice to develop, pilot and refine two feedback interventions focusing on enhancing content and delivery of feedback. To describe how A&F for blood transfusion practice is currently operationalised and to analyse the components of existing feedback documents. To systematically identify methods by which the content of current feedback may be enhanced. To develop an intervention guidance document and training materials for preparing enhanced feedback content. To prepare a prototype of a feedback document with enhanced content to be delivered as part of study C (Feasibility and acceptability). A structured content analysis of the key components of existing feedback documents, based on relevant evidence , current theories, and frameworks for understanding behaviour change. Since its inception in 2002, the UK NHSBT has conducted a total of 19 A&F cycles examining different aspects of blood transfusion practice. An A&F cycle typically has a set of pre-specified ‘audit standards’ (e.g. a pre-transfusion haemoglobin reading is taken in 100% of patients prior to transfusion). These standards are often based on existing, relevant clinical guidelines and evidence, and represent the specific transfusion-related behaviours being audited. Feedback recipients’ behaviour will be compared against these standards. A&F cycles in the NHSBT audit generally consist of three distinct stages: Pre-Audit, in which hospitals are invited to participate in the audit; Audit, during which audit data are collected; and Feedback, in which results from the audit are fed back to the hospitals. Different types of documents are utilised within each of these stages, and this study will specifically examine documents from the feedback stage (e.g. written reports, action planning templates, or PowerPoint presentations) (See Additional file 1 for an example of a current blood transfusion feedback report). To examine how current A&F is operationalised in the context of blood transfusion, such documents from previously conducted A&F cycles will be obtained from NHSBT and systematically examined using a comprehensive coding framework (see below). have explicitly stated audit standards (i.e. target behaviours). Inter-rater sampling agreement amongst reviewers will be assessed using Cohen’s Kappa, with a minimum Kappa value of 0.75 indicating an acceptable level of agreement . To conduct the structured content analysis, a comprehensive coding framework will be developed and applied to describe the characteristics and components of the feedback documents. An established, reliable taxonomy of 93 BCTs  will be embedded within the coding framework to enable specification of BCTs comprising feedback content. Data will be extracted on the number and frequency of different BCTs identified within each document. The extent to which BCTs consistent with Control Theory  (e.g. ‘goal-setting,’ ‘discrepancy between current behaviour and goal’) are included in current feedback documents will be examined. The coding framework will also include items to examine the behavioural specificity of the audit standards. Behavioural specificity will be examined according to the TACT Principal: Target, Action, Context, and Timeframe . For instance, the behaviour ‘referring patients with back pain for lumbo-sacral spine x-ray’ may be specified using TACT as follows: Target, ‘patient’; Action, ‘referral’; Context, ‘clinical condition (back pain)’; and Timeframe, ‘(implicitly) during the consultation’ . We propose to extend the TACT principle to additionally specify the audit standards in terms of the ‘Actor,’ that is, who is responsible for performing the behaviour (e.g. physicians). The percentage of audit standards in which the behavioural Target, Action, Context, Timeframe, and Actor is clearly specified will be examined. The extent to which audit standards are specified in the same manner across different documents pertaining to the same A&F cycle will be examined. Findings from the Cochrane review of A&F  regarding the effectiveness of different A&F strategies will further inform the development of coding framework items for assessing the characteristics of feedback content. These will include: feedback provider and recipient; level of data fed back (i.e. group vs individual); mode of delivery (i.e. written vs graphical); whether or not the feedback item is explicitly related to an audit standard; recipients’ baseline behaviour and actual behaviour or attainment level; whether normative information is provided about others’ behaviour; whether an explicit comparison is made between the recipients’ behaviour and a comparator; if yes, the nature of the comparator (e.g. others, clinical guidelines or standards, past behaviour); and whether or not feedback is presented in conjunction with action planning and/or goal-setting. The percentage of feedback items explicitly related to an audit standard will be computed. The TACT principle  will be applied to examine the extent of behavioural specificity of each feedback item, as well as any accompanying action plans or goals set in response to feedback. It is important that feedback documents are presented in a clear and comprehensible manner if their content is to be accessible and understood. Therefore, the layout and structure of documents will be examined using items from the Suitability of Assessment Materials framework , a validated framework for assessing the suitability of printed health information materials in terms of their layout, literacy demand, typography, and graphics. The feedback documents will be analysed using the coding framework by two members of the research team in consultation with the research team’s clinical lead. Inter-rater coding reliability will be assessed using Cohen’s Kappa or percentage agreement as appropriate, with a desired minimum Kappa value of 0.75 or 75% agreement; indicating an acceptable level of agreement . Possible enhancements of feedback content will be considered concurrently with coding and this process will be conducted in two steps. First, the current content of feedback documents will be specified in terms of the BCTs that are included and the level of behavioural specification. Second, members of the research team will examine this specification to identify aspects of the documents that may be re-written or enhanced. This step will be guided by theory, such as Control Theory , and principles such as TACT-A. For example, if it is found that only a narrow range of BCTs consistent with Control Theory are currently featured in feedback documents, enhancement could include re-writing the feedback documents so that the omitted BCTs consistent with Control Theory are delivered (See Additional file 2 for an example illustrating the potential enhancement of feedback content to increase the delivery of BCTs consistent with Control Theory). Similarly, if for instance it is found that the timeframe is rarely or poorly specified in the audit standards, standards will in turn be re-written to clarify and increase behavioural specificity in terms of timeframe (e.g. specifying whether the behaviour is to be performed pre- or post-transfusion). The identified enhancements will be integrated into a prototype set of feedback documents (templates) for delivering enhanced content. Such identified methods for enhancing feedback content and the resulting, theoretically enhanced prototype documents will be discussed with a multi-disciplinary consensus panel (comprising three or four experts in behaviour change, three or four blood transfusion clinicians, a methodologist from the AFFINITIE Trials team, a representative from the National Comparative Audit, and a patient representative), in order to ensure that the suggestions are theoretically appropriate, acceptable from a clinician’s perspective, feasible from the perspective of trial design, and appropriate for the context at which they are aimed. Following this, the proposed interventions will be revised and refined as required. It is possible that analysis of data from study B (Delivery; see below) will also inform the development of this intervention. A guidance document (i.e. intervention protocol) and accompanying training materials describing the principles of analysing and writing enhanced feedback content and a prototype set of feedback documents with enhanced content that will be piloted in study C (Feasibility and acceptability). Identify how delivery of feedback is currently operationalised in practice in the hospital context, and how this could be enhanced. Identify who currently receives feedback (i.e. types of healthcare professionals and organisational levels), and who should receive feedback. Develop an intervention protocol for enhancing the delivery of feedback to all relevant staff (identified from objective two), along with practical guidance for clinical teams on how to respond as a team to feedback, using appropriate behavioural strategies. The study will use a case study design involving semi-structured interviews and observations of transfusion related meetings at four hospital sites in England. Potential hospitals and Trusts (i.e. organisational units within the National Health System in which hospitals or clinics are nested) will be identified through consultation with the clinical lead on the research team, and will be selected from those who take part in the NHSBT national comparative audits of blood transfusion. A purposive sampling strategy will be used to identify hospital sites that are diverse in their infrastructure and level of resources (e.g. role of Transfusion Practitioner) and to include at least one teaching and one district hospital. These hospitals will be approached by a clinical member of the research team through their respective Trust Research and Development (R&D) Offices, with the first four to respond to be selected for study B (Delivery), once diversity across the hospitals has been established, and the remaining four to then be approached for the subsequent study C (Feasibility and acceptability: outlined below). A purposive sampling strategy will be used to identify five to eight healthcare professionals within each of the four study B (Delivery) hospitals who reflect the range of individuals involved in, or with influence over, transfusion decisions, or who are responsible for following practice recommendations (e.g. clinical leads, senior clinicians, haematologists, hospital transfusion committee members, junior doctors, regional transfusion professionals). Diversity of the sample will be monitored to ensure that interviews are conducted with a representative range of healthcare professionals from different organisational levels, and to establish how widely the current feedback is disseminated to and discussed by these professional groupings. During R&D approval, a local transfusion contact will be identified to help identify potential interviewees and transfusion related meetings to observe. Details of relevant meeting to observe will determine the potential dates for the research visit to the site. Potential interview participants will be sent a recruitment email with an accompanying information sheet and consent form, to enquire if they are willing to participate in an interview, following informed consent an interview will be scheduled. It is anticipated that there may be circumstances in which participants who are originally scheduled for interview are not available on the day due to the nature of their clinical responsibilities, and also that the list provided from the clinical contact would not be exhaustive of the range of individuals involved in transfusion decisions. Therefore, a second opportunistic recruitment strategy will be employed whereby additional eligible healthcare professionals who are present at the hospital during the data collection period will be given the opportunity to volunteer for interview, with the same process of informed consent applied as to those approached ahead of the visit. An interview topic guide will be developed to elicit information using constructs from the TDF  and the CFIR . As the interviewees will be from a range of professional roles and may vary in their previous involvement with A&F, the topic guide will begin with some general questions about transfusion decision making, and awareness of current A&F processes. This will help to identify individuals who are involved in the transfusion decision-making process but who do not currently receive feedback, and may inform the potential target groups for enhanced interventions. The topic guide will include questions about Ferlie and Shortell’s  four levels of change for improving quality: the individual, group or team, organisation, and the larger system or environment. A wide range of potential methods of delivery and their acceptability will be explored in the interview. To explore the validity of the topic guide prior to conducting interviews, items will be double coded into TDF domains and CFIR constructs by two researchers. Percentage agreement will be calculated as an indication of inter-rater reliability and consensus on coding will be achieved through discussion between coders. The schedule will be piloted with healthcare professionals to allow refinements of question wording and delivery. If possible, we will observe key meetings disseminating audit feedback to identify organisational feedback processes. An observation sheet will be developed to record the observations. This will focus on elements such as the structure, function (e.g., behavioural regulation, social influence, information provision), group processes, body language, and the content of A&F discussion within the key meetings. One-to-one, semi-structured interviews, based upon the topic guide and lasting a maximum of one hour, will be conducted face-to-face at the hospital at a time convenient for the interviewee. Interviews will be audio-recorded with permission. Two researchers will attend each key meeting, with the consent of the Chair, and use a tailored observation sheet to record observations. Audio-recorded interviews will be transcribed verbatim and anonymised. Interview text will be coded into the relevant domains (TDF) and constructs (CFIR), and, in the manner reported by Patey et al. , the first transcript will be coded concurrently by two researchers to develop a coding strategy for subsequent transcripts. Subsequent transcripts will be coded by one researcher, with 10% independently double coded. Cohen’s Kappa will be calculated to assess whether the same interview responses are coded into the same domains or constructs, with a minimum Kappa value of 0.75 indicating an acceptable level of agreement . Consensus will be reached through discussion, with a third independent coder asked to help resolve any outstanding disagreements. After responses have been coded using the theoretical frameworks, emerging themes within each domain or construct will be identified across the transcripts. The second coder will review the themes to verify an accurate representation of interview content. To complement the data collected in the interviews, organisational feedback processes will be identified from observational data, e.g., how feedback is discussed between individuals and teams within the meeting, and the potential group processes that influence feedback and decision making. These observations will allow researchers to explore whether such meetings would be an appropriate context in which enhanced feedback could be delivered to hospitals, through identifying individuals with key job roles and responsibilities related to the A&F process, and observing how these individuals could play a role in delivering feedback during the enhanced interventions (study C: Feasibility and acceptability). Initially, each hospital will be analysed as a single case study in order to understand the feedback processes within the organisational structure. Findings from the four sites will then be compared and contrasted using a triangulation process , to identify common and contrasting themes across hospitals and within healthcare professional roles. Improve the ‘reach’ of the feedback documents. For example, if it is identified that key individuals involved in transfusion decisions are not typically receiving feedback from an A&F cycle (e.g. junior doctors), this group could be targeted by the enhanced delivery intervention. Identify, from the interview data, key domains or constructs that could be addressed by BCTs. For example, if interviews identify that staff think current blood use objectives are unrealistic (i.e., the domain beliefs about capabilities), an enhanced intervention may include support materials that deliver the BCT, ‘review outcome goals,’ so that staff are able to work towards a goal that they feel is achievable. Incorporate direct suggestions by interview participants. Discussion of the potential feedback methods during the interviews will help identify ways in which feedback processes could be enhanced; e.g., through the development of targeted action plans for clinical teams. Identify, from analysis of the observational data from the observed clinical team meetings, any potential for enhancement; e.g., provision of support materials focusing on group processes could facilitate the dissemination of information and team-level discussion of responses. The identified enhancements from the interviews and meeting observations will be integrated into an intervention protocol and set of supporting documents. It is possible that analysis of data from study A (Content) will inform the development of this intervention. An intervention protocol for enhancing the delivery of feedback to relevant staff, along with practical guidance and support materials for clinical teams on how to respond as a team to feedback, using appropriate behavioural strategies. Integrate the enhanced interventions that are developed during study A (Content) and study B (Delivery). Deliver the enhanced intervention to a pilot sample of four hospitals. Assess the acceptability and feasibility of delivering such enhancements. The study will use a mixed methods design involving semi-structured interviews, observations and questionnaires at four hospitals in England. The four hospitals identified during recruitment for study B (Delivery; see above) will be approached to participate. The participating hospitals will receive both of the developed interventions as part of an abbreviated NHSBT audit. Purposive sampling will be used to identify up to 10 healthcare professionals who received the enhanced interventions and are responsible for acting upon A&F and making, or influencing, transfusion decisions. Potential participants will be identified using the same procedure outlined for study B (Delivery). Questionnaires will be sent to a representative range of healthcare professionals who are involved in decisions to transfuse at each hospital. Participants will be identified using a purposive sampling strategy, and with the help of the contacts within each hospital. Prototype versions of the two enhanced feedback interventions will be delivered to participants in the context of a re-audit of a recently conducted national blood transfusion A&F cycle. An interview topic guide will be developed to focus on the acceptability and feasibility of the enhanced interventions. Additionally, a brief questionnaire will be developed to assess acceptability of the interventions. Semi-structured interviews following the delivery of the enhanced feedback interventions will focus on how enhanced feedback is interpreted, whether it is discussed within the clinical team and how this happens, whether the team sets standards and develops team-level action plans, as well as any unintended consequences of the revised feedback (e.g. reduced motivation). These interviews will be conducted face-to-face and will last a maximum of one hour. Organised events or meetings where feedback is discussed will be observed, and researchers will aim to identify the group-level response to using the intervention materials through discussion with the clinical teams during this meeting. The brief acceptability questionnaire will be administered to a range of healthcare professionals who are involved in blood transfusion decisions within each hospital. This phase of WS1 (Intervention development and piloting) will also pilot data collection forms for later elements of the programme, such as the additional time and resources likely to be involved. One component of feasibility is the extent to which it is possible to deliver the developed interventions as intended within the target context. Therefore, feasibility will be assessed by examining intervention fidelity in terms of delivery, receipt, and enactment . According to Bellg et al. , fidelity of delivery has been defined as the extent to which the intervention is delivered as intended; receipt as the extent to which the intervention recipient demonstrates understanding of the intervention and knowledge of, and ability to use, the skills or recommendations learned in the intervention; and enactment as the extent to which the intervention recipient performs intervention-related behavioural skills and cognitive strategies in relevant real-life settings as intended. Fidelity of delivery will be assessed using a documentary analysis of the enhanced intervention materials, such as the feedback documents with enhanced content developed as part of study A (content), and the delivery support materials developed through study B (delivery). This analysis may include, for instance, an assessment of the extent to which the proposed methods of optimising the content of feedback documents (i.e. by including BCTs consistent with Control Theory or improving the behavioural specification of audit standards) features in the resulting, developed intervention materials. Fidelity of receipt and enactment will be examined via a content analysis of the semi-structured interview transcripts to assess the extent to which feedback has been acted upon, for instance, through development of action plans to reduce any observed discrepancy. Observations of organized events or meetings where feedback is discussed will provide an opportunity to objectively verify receipt and delivery. Acceptability will be assessed in terms of the intervention recipients’ perceptions of the quality and usability of the enhanced feedback, as well as the perceived burden of the enhanced interventions. This will be examined using content analysis of interview transcripts and by computing descriptive statistics from the questionnaire data. Qualitative and quantitative findings will be compared and contrasted descriptively. Findings from this study will inform refinement (if required) of intervention protocols for the two enhanced feedback interventions, and recommendations on the delivery of the interventions in a trial context. Final versions of the intervention protocols will be adopted by the AFFINITIE trials team. Study A (Content) did not require ethical approval. Study B (Delivery) was approved by the Ethics Committee of City University London in October 2013 (Ref: Staff/13-14/09). Research & Development approval has also been obtained from all participating hospitals in study B. Ethical and R&D approvals will be sought for study C (Feasibility and acceptability) once sufficient detail about the enhancements has been developed. Currently (Start of 2014) the A&F cycles and documents have been obtained from the NCA and are being sampled for inclusion. The coding framework is being developed and piloted on a sub-sample of feedback documents. Four healthcare professionals involved in blood transfusion, three experts in behaviour change, and a lay PPI member have been recruited for the intervention validation consensus panel. The interview topic guide has been developed and validated. Four participating hospitals have been recruited, and interviews with up to eight members of staff have been completed at two of these hospitals. Analysis of interview transcripts and feedback documents to inform intervention development has not yet commenced. Recruitment of potential hospitals to participate in the piloting and the feasibility and acceptability assessments of the development interventions is currently underway. The AFFINITIE programme aims to develop and evaluate theoretically enhanced A&F interventions to promote evidence-based transfusion practice and reduce unnecessary use of blood components. Workstream one (Intervention development and piloting) aims to identify how A&F is currently operationalised in the context of blood transfusion and to develop, pilot, and refine two enhanced feedback interventions, focusing on the content and processes around delivery of feedback, which will be evaluated in subsequent workstreams. Workstream one (Intervention development and piloting) will apply evidence , behavioural theory (Control Theory ), theoretical frameworks TDF , and CFIR , and BCTs  to develop the enhanced interventions and to pilot these to assess the feasibility and acceptability of the enhancements. Clear specification of current A&F practice in the context of NHSBT’s National Comparative Audit of blood transfusion practice will inform the design of the C-RCT (WS2: Evaluation), by clearly describing the content of the control and intervention conditions. The interventions will be further informed by the feasibility and acceptability component of WS1 (Intervention development and piloting). The extent to which fidelity is maintained in the context of WS1 (Intervention development and piloting) will provide an indicator of the extent to which the larger-scale evaluation of these interventions will be feasible; if it is demonstrated that fidelity cannot be maintained under these ‘ideal,’ pilot conditions, it is unlikely that high fidelity will be maintained in the context of a larger RCT in WS2 (Evaluation). The larger scale fidelity study (WS3: Fidelity), to be conducted in parallel will the C-RCTs, will compare the delivery of the intervention against the intervention as planned. Finally, the protocols developed for both interventions will facilitate the generalisation of these prototype enhancements to wider contexts outside of blood transfusion (WS4: Implementation). The workstream structure of the AFFINITIE Programme directly reflects the UK MRC guidance on the development of complex interventions. WS1 (Intervention development and piloting) will apply a robust theoretical basis for intervention design. Feasibility and acceptability will be systematically assessed before taking the interventions to formal randomised evaluation. Evaluation of effectiveness, in terms of outcomes, process, and cost effectiveness will be addressed in workstreams two (evaluation) and three (fidelity), with the final workstream four (implementation) disseminating the findings with a view to generalising the interventions beyond the blood transfusion context. The multidisciplinary expertise from both behavioural and clinical areas will inform the intervention (the AFFINITIE research team includes haematologists, trialists, health psychologists, social scientists, statisticians, health economist,s and patient representatives). This is further strengthened through the contribution of the PPI panel. The methods for intervention development described in this protocol nonetheless have a range of limitations. First, current practice is always improving and there is no guarantee that the specification of usual feedback practice based on past A&F cycles will precisely describe the control conditions in the proposed trials. Hence, the planned fidelity study will examine the control interventions as well as the enhanced interventions. Second, even if the enhanced interventions are feasible to deliver in the context of clinical practice, they may not be feasible to deliver in the context of a time-constrained trial. Hence, there will be some constraints on intervention design. Finally, although we will attempt to recruit diverse samples of hospitals for study B (delivery) and study C (feasibility and acceptability), it is possible that staff in hospitals that are willing to participate in these stages of the study will place transfusion practice higher on their agenda than other English hospitals. Of note is that fact that hospitals participating in study C (feasibility and acceptability) will not be eligible to participate in the trials (as they will receive the enhanced interventions in order to provide data about feasibility and acceptability). Hence, it is possible that the feasibility and acceptability data will not be fully representative of all English hospitals. We accept these limitations as necessary restrictions, given the importance of checking feasibility and acceptability prior to full evaluation. We believe that the methods presented in this paper demonstrate a theoretically robust, evidence-based, consultative model of research as an example of good practice for intervention development and we offer these methods to the research community with a view to sharing good practice in the design of complex implementation interventions. This paper summarises independent research funded by the National Institute for Health Research (NIHR) under its Programme Grants for Applied Research Programme (Grant Reference Number RP-PG-1210-12010). The views expressed are those of the authors and not necessarily those of the NHS, the NIHR or the Department of Health. Aspects of this protocol have been discussed with the full AFFINITIE programme research team. NG led the drafting of the manuscript and contributed to the development of study design and methods. FL contributed to the study design and development of the methods, and drafting of the manuscript. SS was the clinical lead, contributed to the development of study design and methods, and drafting of the manuscript. SM and MEP were advisors on the theoretical basis and methods, and participated in the drafting of the manuscript. LG provided PPI input and participated in the drafting of the manuscript. JMG holds a Canada Research Chair in Health Knowledge Transfer and Uptake, contributed to the study rationale, design, and drafting of the manuscript. JJF led the development of the methods and study design, and participated in drafting the manuscript. All authors read and approved the final manuscript. British Committee for Standards in Haematology: http://www.bcshguidelines.com. Cochrane Library Special Collection: Avoiding unnecessary transfusion. 2012. http://www.thecochranelibrary.com/details/collection/2116331/Avoidingunnecessary-blood-transfusion.html. NHS Blood and Transplant: National Comparative Audit of Blood Transfusion. http://hospital.blood.co.uk/safe_use/clinical_audit/National_Comparative/index.asp.